THE BEST 1-day organized ride I have ever done, which every year provides both a physical and mental challenge such that the sense of satisfaction and accomplishment at the end leaves me coming back for more year after year. eNews Sign Up: The Info You Want Right In Your Inbox! Once you sign up, your email address will be saved. 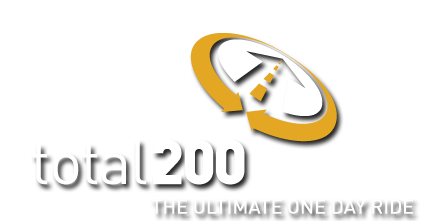 In the future, you will receive periodic emails with updates and information about Total 200. Privacy is important to us because it's important to you; therefore, we will not sell, rent, or give your name or email to anyone. That simple. You will also be able to edit or unsubscribe at any time from the bottom of our emails or right here.